Donald Trump angered many when he said that if he becomes US President a wall will be built to stop Mexicans from sneaking into the US. But it seems that his security problems don't just lie south of the border. A Mexican construction worker has displayed the Mexican flag at the top of the Trump Tower in Vancouver to protest about the Republican front-runner's attacks on the character of his fellow expatriate workers. 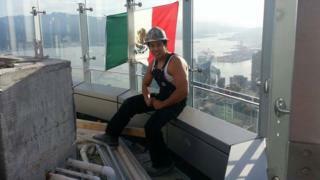 A photo of Diego Reyna posing in his construction helmet next to the flag has gone viral after he posted it on Facebook and has been shared several thousand times. Explaining the motivation behind the stunt, Reyna wrote that he was taking a stand not just for Mexicans but on behalf of all immigrant workers who felt they had been unfairly demonised by Trump. "The comments Trump has made about us, did not stop us from doing the high quality work we have always done, in our home country or when we migrate to the US/Canada," he commented on Facebook. Then addressing his remarks directly at the tycoon-turned-politician, he added: "The insults you have said about us, have not changed our work ethics. While working on your tower Mexicans didn't steal anything nor raped anyone, we just did the best work we could possibly do, for ourselves, our families and the future tenants in your building." Reyna is originally from Chiapas in Mexico but has been a permanent resident of Canada since 2011. He did not work on Trump Tower, but says he knows many people who have. "I have tons of friends who work on that site, and they wanted to do something but they were too scared to try anything," he told BBC Trending. "They are scared of losing their resident permits or having consequences. I did this for them." Reyna and a friend carried out their ascent of the building - whose full title is the Trump International Hotel and Tower - on Saturday morning. After taking the elevator to the 28th floor they then climbed more than 20 floors by the stairs. Somehow Reyna managed to recover his breath sufficiently to also record a short video. The flag had been removed by Sunday. Trump has yet to comment on the stunt. He has made the fight against illegal immigration one of the main planks of his campaign and outraged Mexicans last June when he called undocumented Mexican migrants "criminals" and "rapists". The Mexican President Enrique Pena Nieto has even compared his rhetoric to that of German Nazi leader Adolf Hitler. Reyna told Trending: "My entire nationality is being negatively portrayed..The whole world is hearing that Mexicans are rapists and criminals. A lot of people don't know where Mexico is, so they only hear what Trump is saying about us." Next story: Is it OK for white people to have dreadlocks?